Over the years I have had to deal with the unpleasant task of renumbering references. 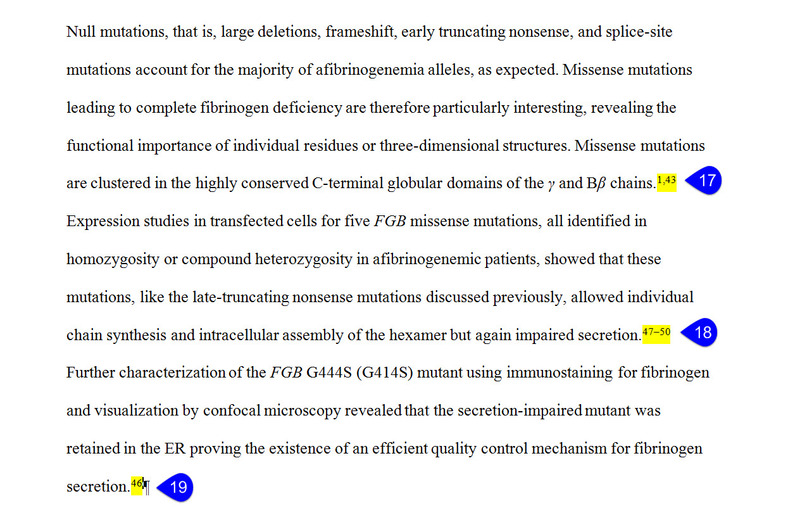 Perhaps the author updated the references by inserting “a,b,c” references, such as 57a, 62a, 62b, rather than renumbering. Perhaps the author inadvertently numbered two different references with the same number. 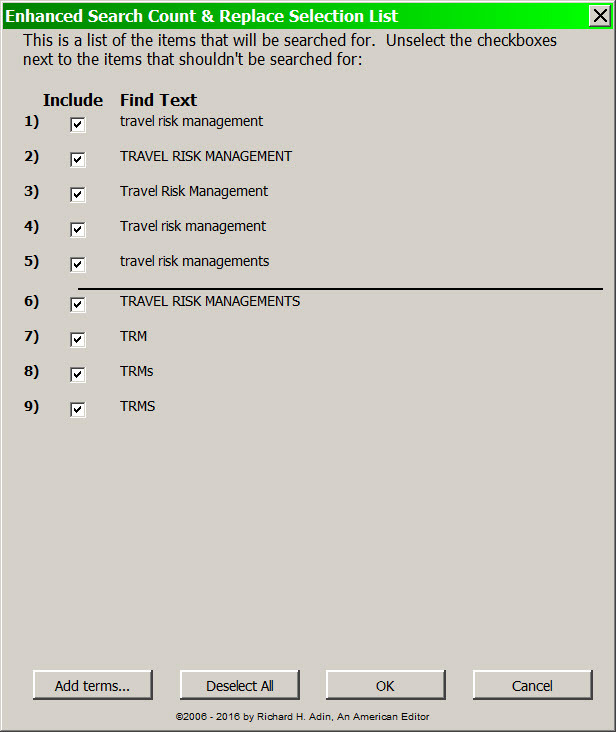 Or, even more troublesome, made the reference list alphabetical, numbered the list, and inserted in the text the reference numbers but in a random order, depending on which reference needed to be referred to (e.g., reference callouts in the text might be in this order: 77, 23, 44, 45, 1, 5, 3, 88). In all instances, the client wants the references called out in order (i.e., 1, 2, 3, 4, etc.) and “a,b,c” references converted to the correct number (e.g., 57a would become 58, what was 58 would become 59, etc.). 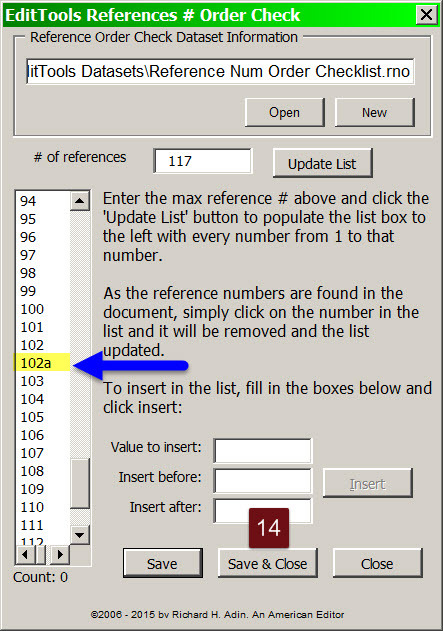 This renumbering problem isn’t so bad when there are only a handful of references, but I have dealt with chapters requiring renumbering of 400, 500, 600 — even as many as 1100 — references. (Occasionally, the client would agree to leave the numbering as it was provided by the author when the number of references to be renumbered was more than a few hundred, but more times than not the client insisted that the references be renumbered regardless of the number involved.) The process meant that I not only had to renumber the in-text callout, but I had to renumber the reference itself and move it — plus I had to have some method of tracking the changes because of the ripple effect. 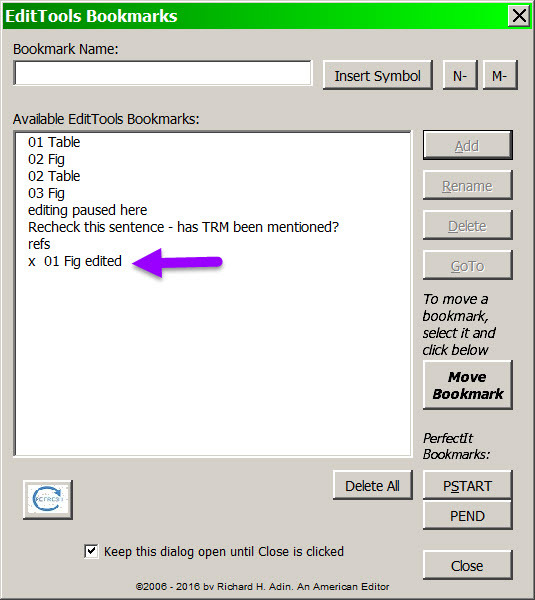 For example, if the first in-text callout was 77, it had to become 1, and the reference had to be moved to the 1 position in the reference list. I had to have a method to note that what was 77 was now 1 in case 77 appeared in the text again (e.g., as part of a range, such as 74–79) and so that I knew that the number 77 could be assigned to another reference number. 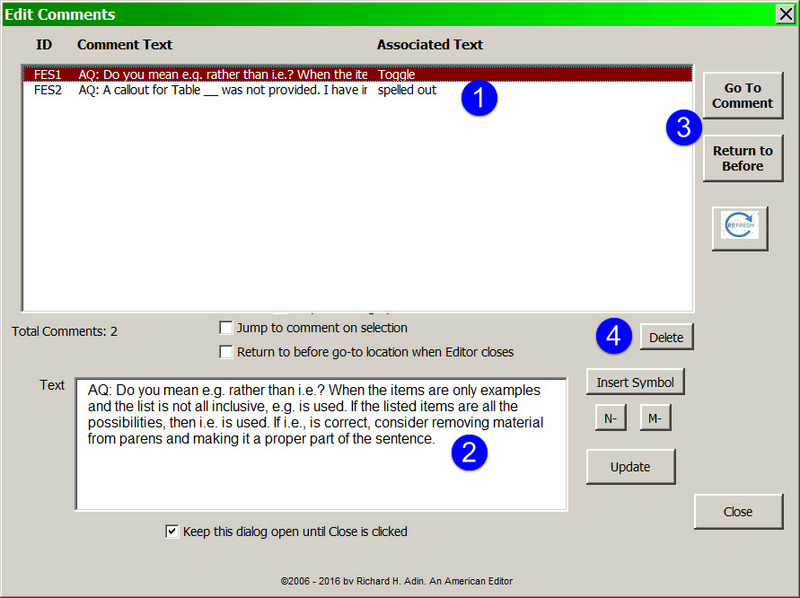 Until EditTools 7.0, the method was pen and paper, a method that took time and invited errors, especially in chapters with many hundreds of references. 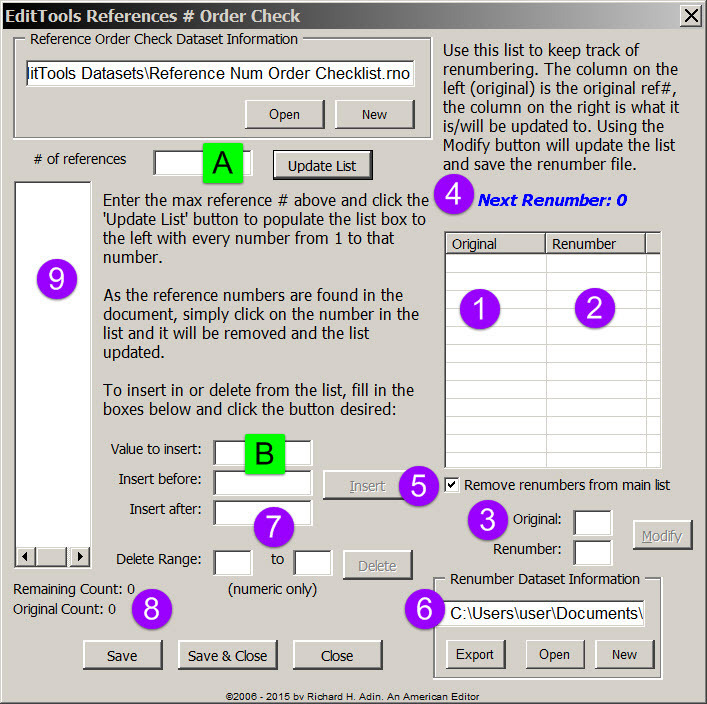 The original version of Reference # Order check only tracked callout order (see “The Business of Editing: Keeping Reference Callouts in Number Order“); version 7 is greatly enhanced. 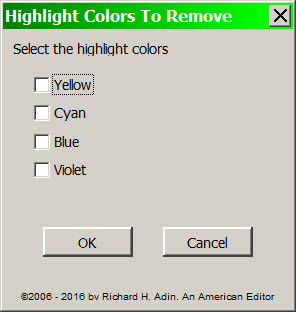 Note that there are two “list” areas in the dialog: #1 and #9. Although each is used for a different purpose, they are complementary. 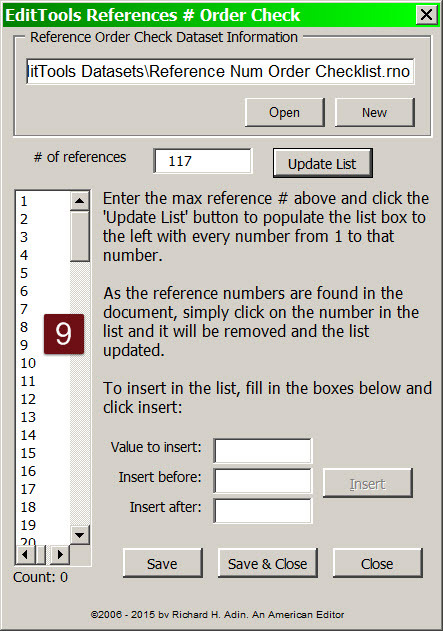 The #9 list is used to track reference callouts; #1, combined with #2, is used to track renumbering. 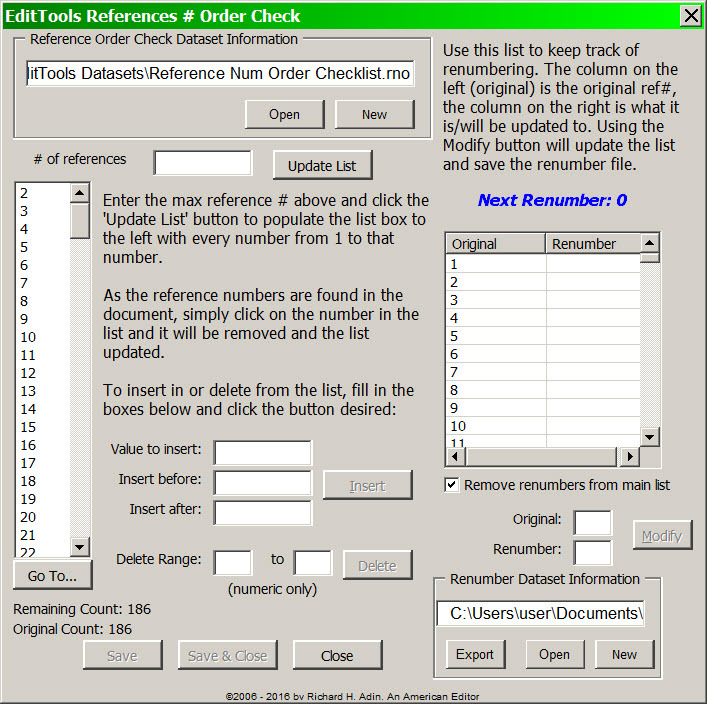 You begin by creating a list of the reference numbers in the document. 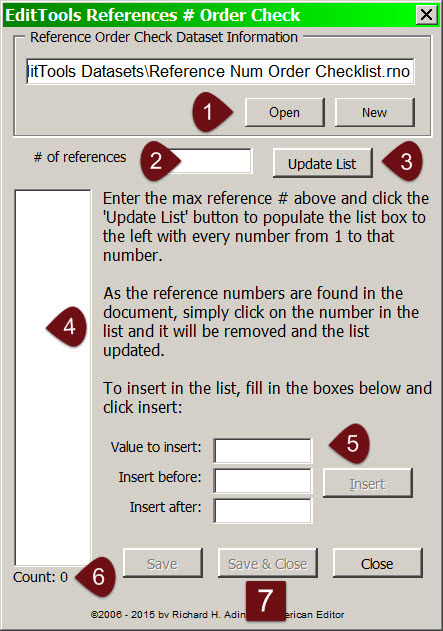 If the reference list has 50 entries, you enter 50 in the Update List field (#A) and click the Update List button. This will cause the lists at #9 and #1 to be populated with the numbers 1 to 50. 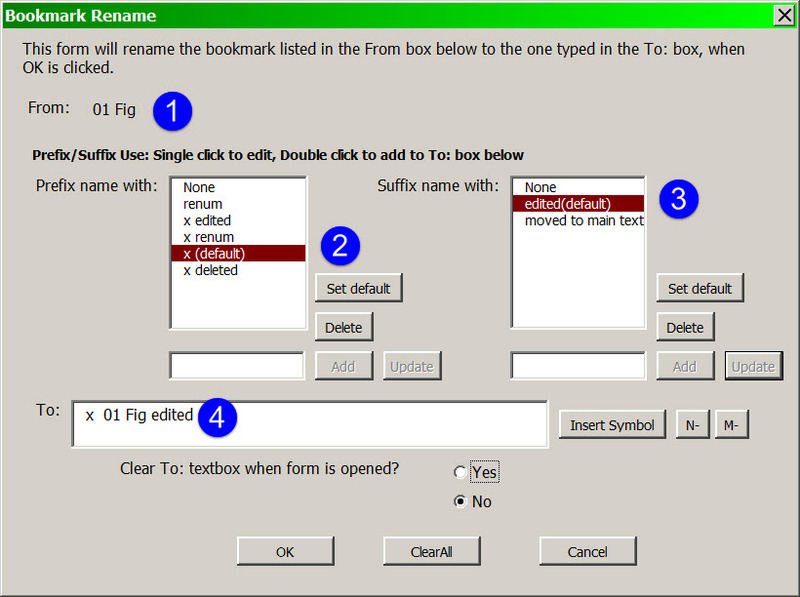 If you happen to spot some a,b,c numbers, you add them by entering them one at a time using the Value to Insert (#B) field and either the Insert Before or Insert After field, and clicking the Insert button. 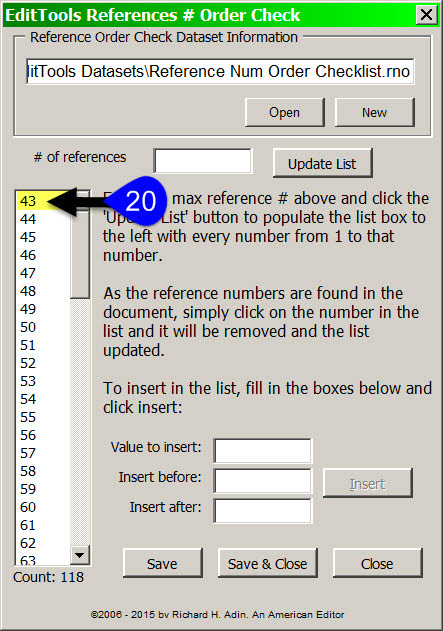 For example, if you need to add 39a and 39b, you would enter 39a in the Value to Insert field and either 40 in the Insert Before or 39 in the Insert After field. Once 39a is inserted, you would repeat the process for 39b except that you would use 40 in the Insert Before field or 39a in the Insert after field. 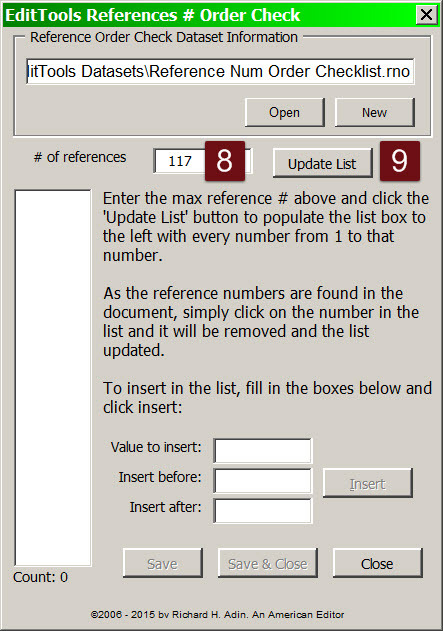 Clicking Insert adds the a,b,c references to both the #9 and the #1 lists. 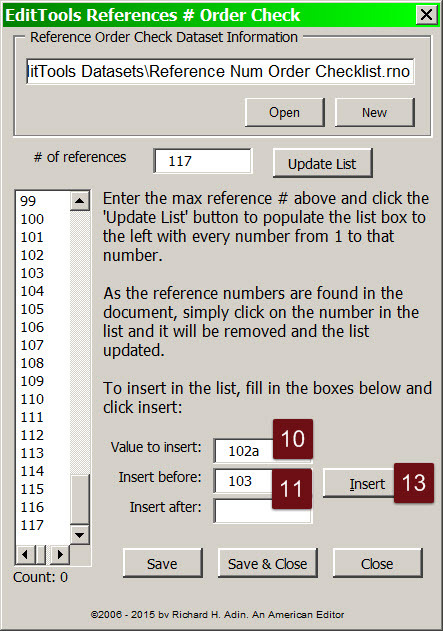 If no renumbering is needed, you use the #1 list to track references to ensure they are called out in number order. When you come to the first callout, if it is number 1 as it is supposed to be, you click on 1 in the #9 list. 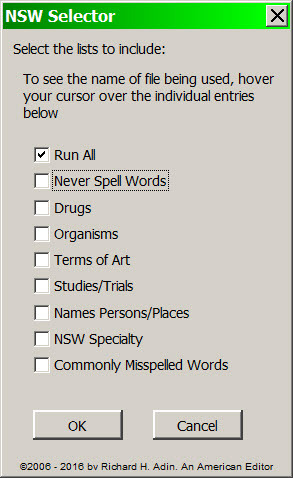 That will remove the 1 from that list, but not from the renumbering list (#1). 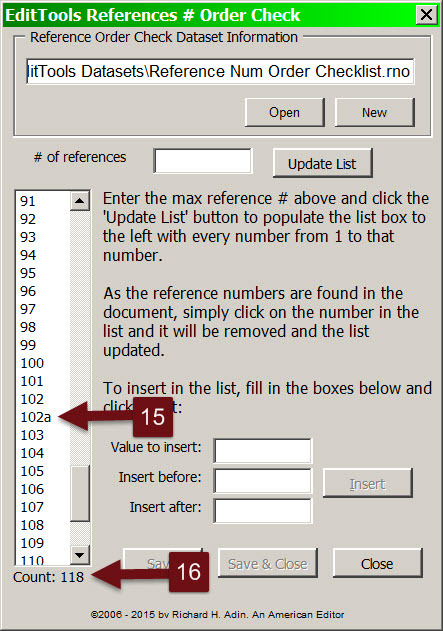 If the next called-out number is a range, such as 2–15, you can either click on each number individually in list #9 or you can delete the entire range at once by entering the 2 in first Delete Range field (#7) and 15 in the second field and clicking Delete. 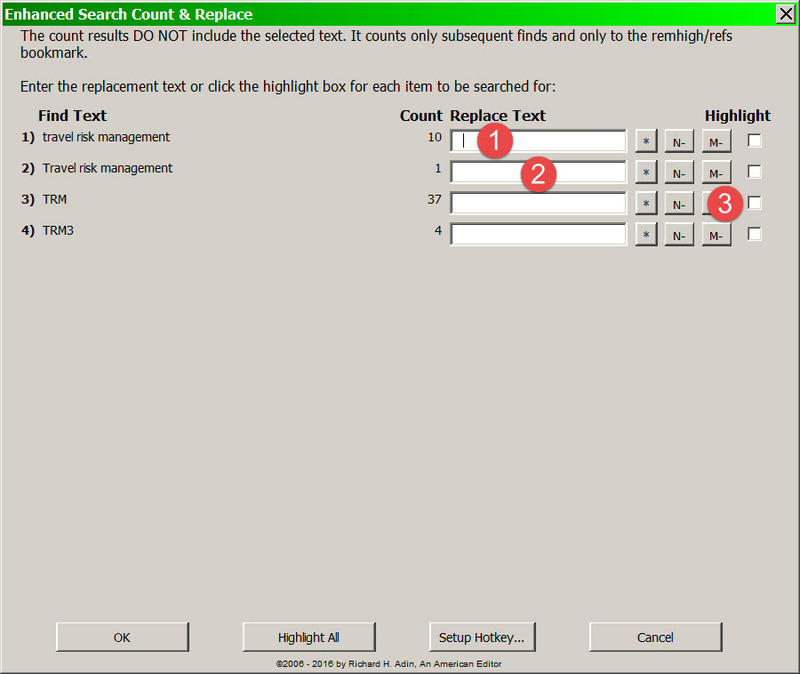 The Count (#8) tracks the number of references in the document at the start and how many remain to be checked. 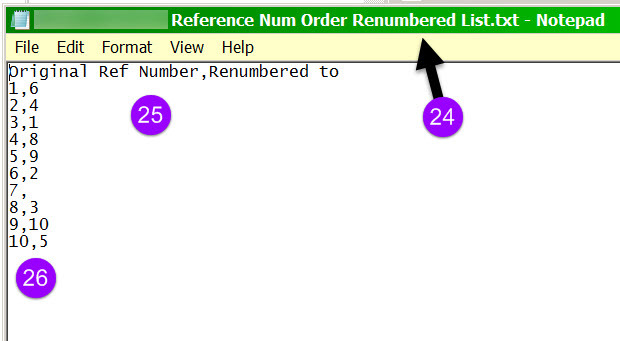 The Next Renumber (#4) serves as a reminder of the next renumber to use. 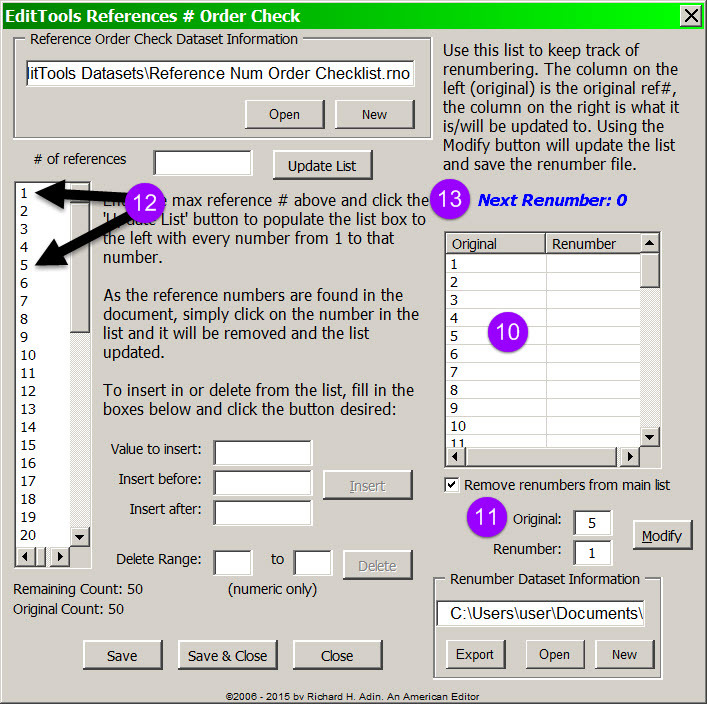 The Renumber Dataset Information file (#6) allows you to save the renumbering information. 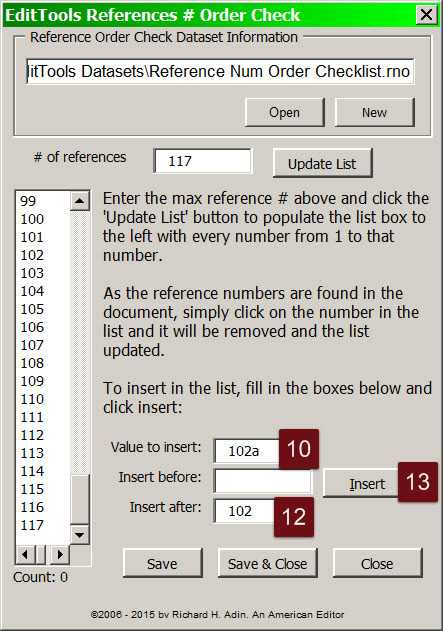 In the renumbering fields, 1 appears next to the 5 (#14), indicating that former reference number 5 is now reference number 1. 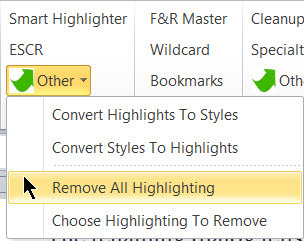 In addition, because the Remove renumbers from main list is checked (the default) (#5 above), the number 1 has been automatically removed from the main list (#16). And, the Next Renumber (#15) shows 2 (compare to #13 where it was 0), meaning that if you have to renumber the next callout, it is to be renumbered as 2. If the next callout is 2, then it needs to be removed from the main list (#16 above). If then the next callout is 7, it is renumbered as 3 following the same process (#17 shown below) and the Next Renumber becomes 4 (#18). 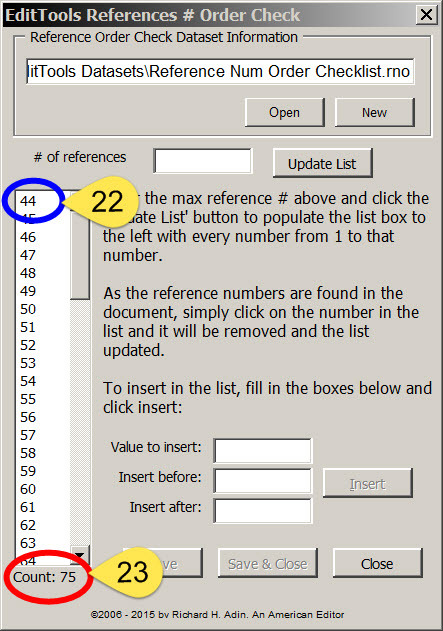 Note that the Counts at #20 have not changed from the original numbers; it still shows that there are 50 references in the document, none of which have been called out. 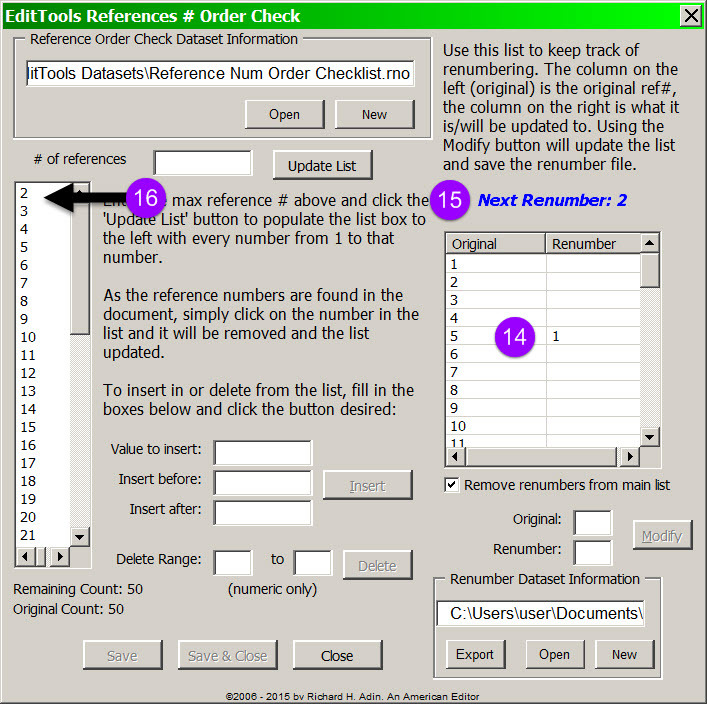 That is because we have not manually removed a number from the Reference Order list (#19). When we click on the 2 to remove it (#21), the Count updates automatically (#22), as shown below. The Count now tells us that 47 of the original 50 reference callouts have yet to be checked. 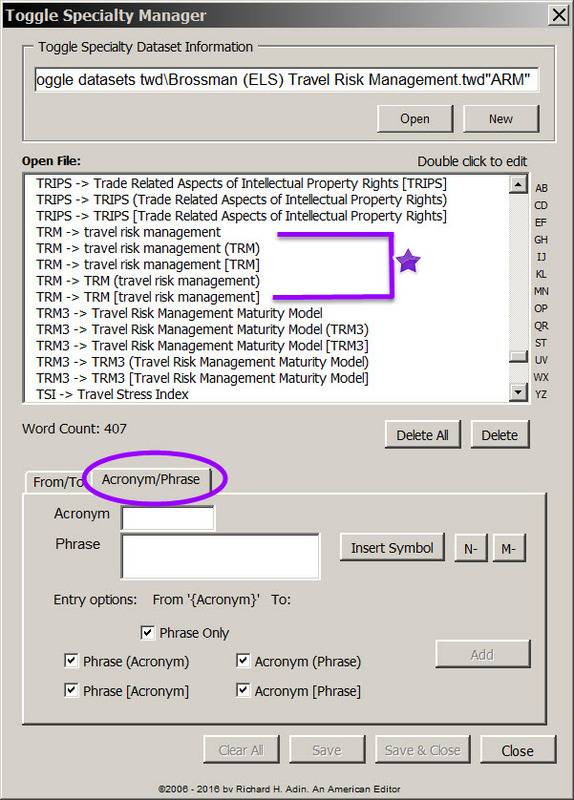 One of the problems with the pen-and-paper method was that it was difficult to save a copy of the renumbering for future reference in case a client had a question and, more importantly, to give a client comprehensive information about renumbering when there was a lot of it. Everything you see is automatically generated, including the first line that explains the numbers (#25). In this example, all of the references were renumbered except for 7. 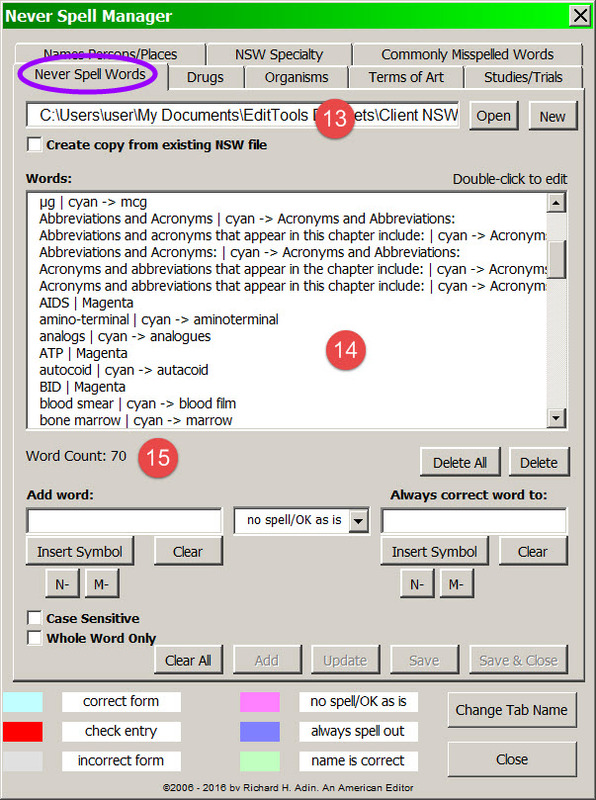 I rename the file to reflect the filename of the file it relates to (e.g., “Jones Disorders 011 Renumbering.txt”). 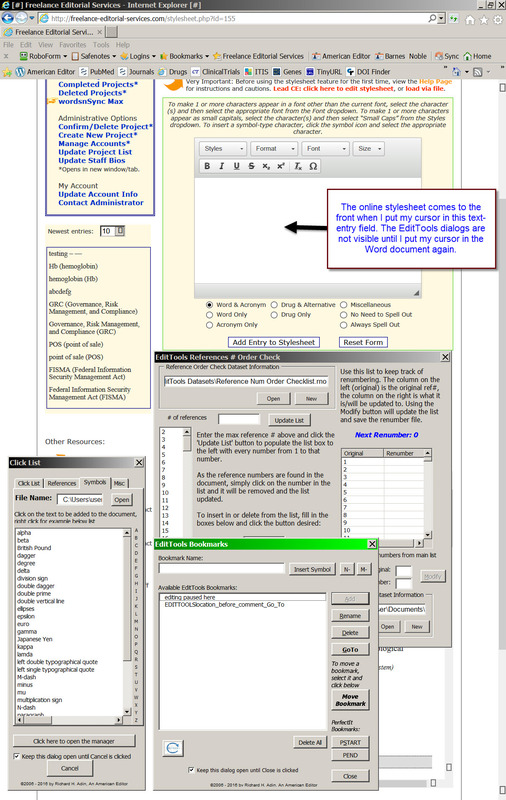 I keep a copy with my copy of the edited project files and send a copy to the client along with the edited document. 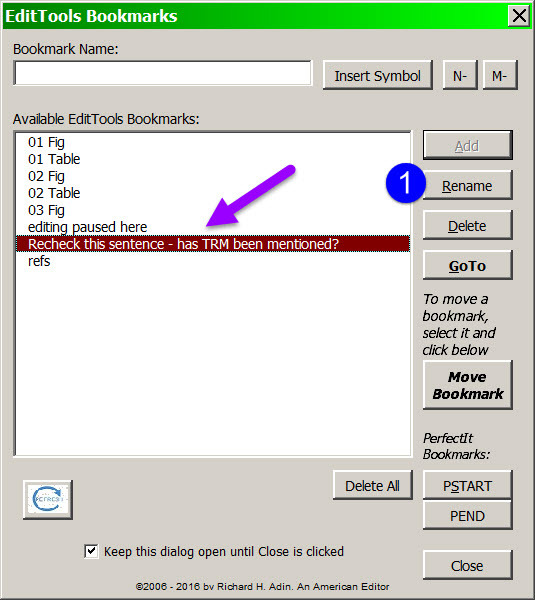 This way the client and the proofreader can track the renumbering, and should a question arise, I have a copy to review. One key to being a successful freelance editor is providing clients with services they cannot easily get elsewhere. A second key is being able to do tasks efficiently and accurately. 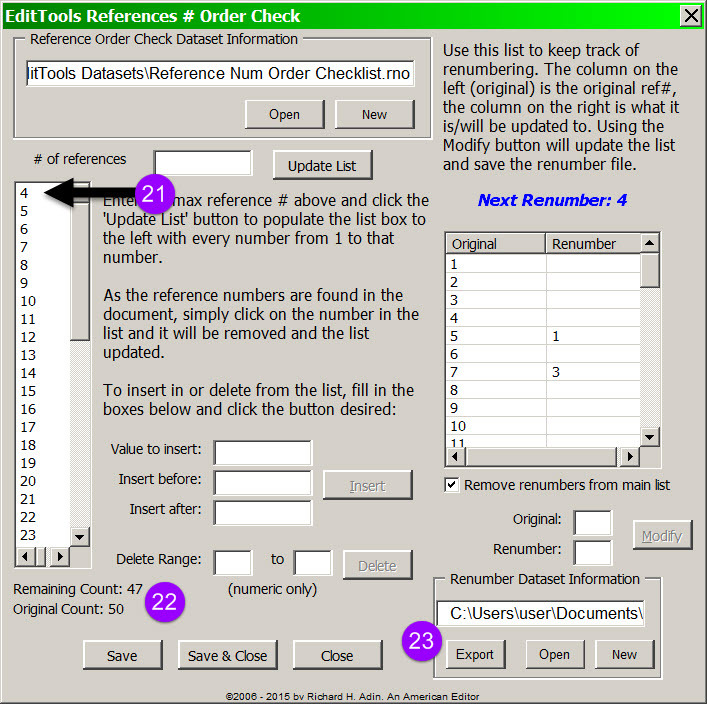 The Reference # Order Check 7.0 macro provides both keys. 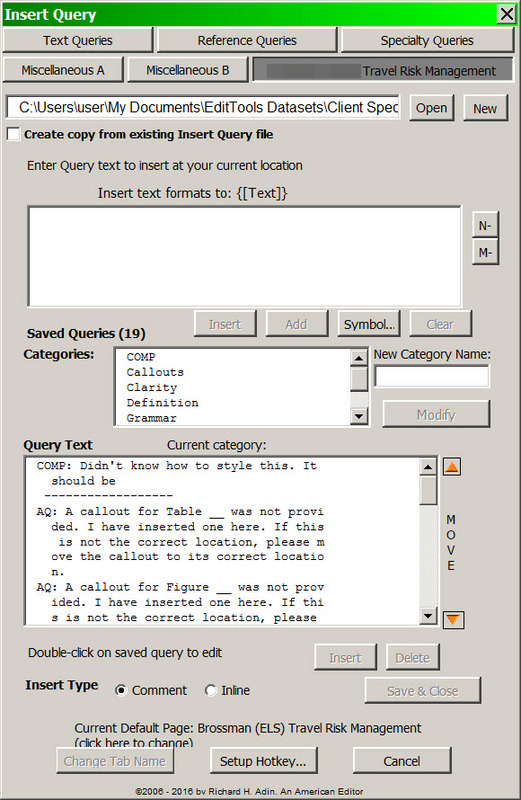 If used, the macro can make an otherwise problematic task easy to accomplish. If you aren’t using EditTools‘ Reference # Order Check 7.0 to track and renumber references, how do you do it efficiently and profitably?